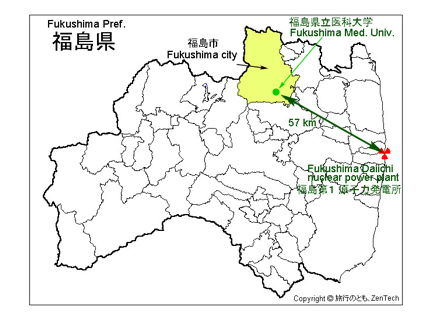 The Nishimiya Fellows Program is a week-long seminar held at Fukushima Medical University (FMU) that introduces students to the topics of disaster medicine and gives them an opportunity to learn more about the long-lasting effects of the earthquake and tsunami that devastated northeast Japan in 2011. This program has both a classroom component and an experiential component. Students spend a couple of days at seminars and training sessions on radiation biology and disaster medicine, and the remainder of their time volunteering at community centers and visiting the areas most affected by the tsunami. Some of the on-the-ground experiences that students have taken part during the past 2 years include visits to a health fair for mothers and children at a temporary housing facility, a thyroid cancer screening center for children, and a mental health clinic. Students also traveled to a region destroyed by the tsunami and went on a tour of the base for workers cleaning up debris from the Daiichi nuclear power plant. Throughout the program students worked closely with physicians and staff at the Education Center for Disaster Medicine at FMU, and had the opportunity to interact with 5th and 6th years medical students (equivalent of 3rd and 4th year students in a U.S. medical school system) at FMU. The program began in 2012 with funding from the Japanese Medical Support Network (JAMSnet) and support from the Education Center for Disaster Medicine at FMU under the leadership of Dr. Kumagai and Dr. Fukushima. This program was also organized as part of the Honjo-Japanese Medical Society of America (JMSA) scholarship program supported by JMSA. Students selected for this program are named Nishimiya Fellows in honor of the late Ambassador Shinichi Nishimiya, Deputy Foreign Minister and former Japanese Ambassador to New York, who greatly contributed to the effort to aid those affected by the March 11th tsunami and earthquake. Funding: Airfare and living expenses funded by the Japanese Medical Support Network (JAMSnet). Collaborating Organizations: Consortium for Japan Relief (CJR) at Columbia, Japanese Medical Support Network (JAMSnet), Japanese Medical Society of America (JMSA), Honjo-JMSA Scholarship Program, Nishioka Charitable Foundation, Education Center for Disaster Medicine at Fukushima Medical University (FMU) and The Rockefeller Group.